Around 1980 the first steps were made to the creation of the internet as we know it today. (https://en.wikipedia.org/wiki/History_of_the_Internet). It has been over 35 years and it grew out to something nobody can miss in daily life: even most companies can't. Because a huge amount of companies places themselves on the market via the internet, the competition to rank high in search results is huge. You would say most companies nowadays would have a suitable logo design, a good looking website and some good ranking factor included in their website, but this does not seem to be the case for a lot of them. Are they still stuck in the 80s or 90s? As you can tell from the picture below, a massive growth is taking place in the amount of websites that are around on the internet. This proves that competition in most branches will be big already, and that it will not be easy to be recognized as fast. When the internet came up, websites were simple and just aimed at informing the visitor without an eye for design, because the visitor did not know any better and didn't think it was important. Years have gone by, and if you were to ask me, an exponential improvement has been made in the area of webdesign if you look at how information is displayed and how it is displayed in a way the target audience would expect it to be. This is all because website owners have to put in a lot more effort to win visitors for their website: the visitor now knows what they want and will take a lot more into account than back in the 20th century or even the 00s. Websites used to be very clunky and packed with information back then. Nowadays the minimalistic design is a very popular way of making websites, as it shows the website in a pleasant way without bombarding visitors with information. In the picture down below, you can see and example of how Yahoo minimalized its content shown on their first page, so it looks more calm and user-friendly. Once you realize how much a good looking website can mean to you and to your company, you understand that the costs connected to it are negligible. Namely, you can view your website as a full-time employee serving your customers 24/7. It always greets your customers the best way possible, makes them interested in your trade and hopefully make them purchase something. Sadly, the part a webdesign would do for you is only half of it. Of course he tries to optimize your website for search engine ranking, but the true magic is only done by link building and posting new content via for example a blog on your website. 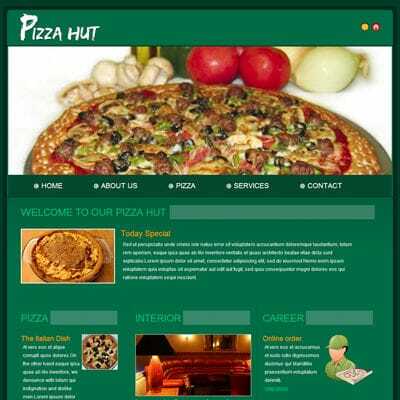 To get things put into context, look at these two Pizza ordering websites. Which one would you choose? Do you now see your customers might think the same if you have a bad looking website while your competition has good looking websites? If you would see both website and both would have had the same Pizzas in store, most people would opt for buying their pizza at Dominos because their website shows professionalism and quality. This is how a lot of clients currently browse the web. What about you? The conclusion is therefore that it might initially look expensive to order a (new) website, but it certainly is a good investment so I would say: make use of it. There's a huge change that clients in your environment are already looking for your company online or at least looking for related companies in your environment. So if you don't have a website or a good looking website, think about investing in it as it could be really beneficial for your company.